Research in the materials and surfaces subgroup in the Rotello Group focuses on the development and manufacturing of functional patterned substrates for nanoelectronics, biosensing, and security applications. By using techniques such as nanoimprint lithography and inkjet printing along with our extensive knowledge of functionalized nanoparticles, we can create low cost materials that are compatible with roll to roll manufacturing. Inkjet printing is a low cost mature roll-to-roll manufacturing technique for creating microscale patterns on surfaces. 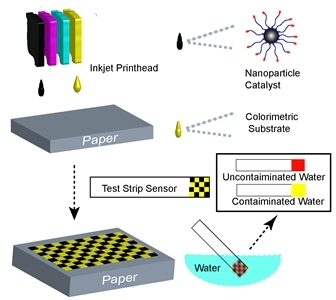 The Rotello Group has recently deposited functionalized gold nanoparticles (AuNPs) onto conductive surfaces for anti-counterfeiting applications using inkjet printing. 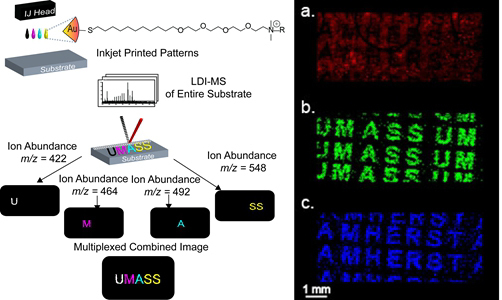 This “mass barcode” can be detect the AuNPs by laser desorption ionization mass spectrometry imaging – a method to determine the spatial distribution of particles based on their mass. By incorporating ligands of varying alkyl chain length that alters the overall mass into the nanoparticle, the area can be selectively scanned for a particular mass. By combining the different nanoparticles onto a surface using inkjet printing enables a complex signature that can be visualized only when all the nanoparticles are scanned. General scheme for nanoparticle security printing using inkjet printing. To prove that this system works, we printed two different patterns on one surface using AuNPs with differing ligands. A) shows the visualized response searching for the mass of gold, b) is the image searching the surface for one of the printed AuNP, and c) shows the surface searching for the second. The Rotello Group is also developing low cost inkjet printed bacterial test strips for recreational and drinking water using nanoparticles. By using the multiple inherent channels of the printer along with chemically modifying the surface of the particle, colorimetric determination of the overall concentration of bacteria can be obtained. Schematic design of a new bacteria sensing test strip for drinking water via inkjet printing. Protein-based materials possess inherent biocompatibility and biodegradability, which being considered as sustainable and eco-friendly alternatives for synthetic polymers. We developed a scalable, additive-free nanoimprint lithography-based method for the fabrication of stable protein films. Micro- and nano- features were fabricated by inkjet printing and nanoimprint lithography, respectively. This approach is general in terms of protein building block, with the imprinted proteins retaining much of their native structure and hence materials properties. Denaturation of protein precursors was minimized by applying both heat and pressure, resulting in hydrophilic surfaces possessing protein characters, e.g. surface potential. By choosing different protein precursors, a variety of films were made to modulate cell-surface interaction, prevent bacteria adhesion, and control release of antimicrobial materials. Adhesion of mammalian cells on micropatterned films. (a) Fibroblast adhesion to protein film generated with a gradient pattern. (b) Number of cells with respect to position along gradient. (c) Fibroblast adhesion to patterned film with discrete Lyso and BSA domains. (d) Fluorescence micrograph of cells adhered to Lyso pattern surrounded by BSA. (e) Optical and (f) fluorescence micrograph of the coculture pattern (green: GFP-expressed HEK293; red: DiD lipophilic tracer labeled RAW264.7). Scale bars were 100 μm for (e) and (f). 1) Wang, L.-S.; Duncan, B.; Tang, R.; Lee, Y.-W.; Creran, B.; Elci, S. G.; Zhu, J.; Tonga, G. Y.; Doble, J.; Fessenden, M.; Bayat, M.; Nonnenmann, S. S.; Vachet, R. W.; Rotello, V. M. “Gradient and Patterned Protein Films Stabilized via Nanoimprint Lithography for Engineered Interactions with Cells.” ACS applied materials & interfaces 2017, 9, 42-46. 2) Wang, L.-S.; Gupta, A.; Duncan, B.; Ramanathan, R.; Yazdani, M.; Rotello, V. M. “Biocidal and Antifouling Chlorinated Protein Films.” ACS Biomaterial Science & Engineering. 2016, 2, 1862-1866. 3) Jeoung, E.; Duncan, B.; Wang, L.-S.; Saha, K.; Subramani, C.; Wang, P.; Yeh, Y.-C.; Kushida, T.; Engel, Y.; Barnes, M.; Rotello, V. “Fabrication of robust protein films using nanoimprint lithography” Advanced Materials 2015, 27, 6251-6255.